A pattern Review for Easter. 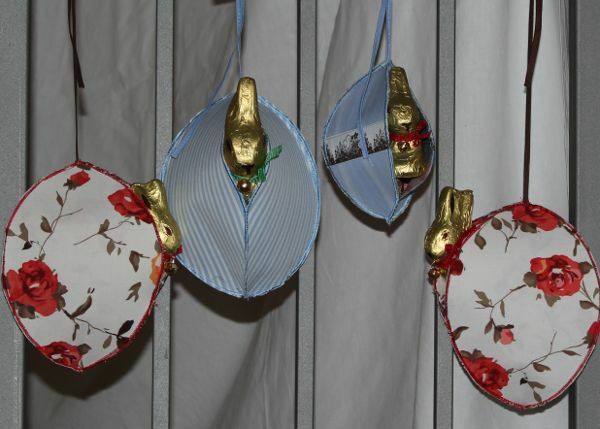 Zuerst wünsche ich euch natürlich allen frohe Ostertage! Da ich ausnahmsweise mal österliche Deko genäht habe, gibt es die passende Schnittkritik dazu. Diese befüllbaren Wand Nester in der März Burda fand ich recht witzig, denn unser Osterbesuch ist inzwischen zu alt, um noch Eier zu suchen (bzw. mir fällt nichts altersgemäßes mehr ein), aber für Schokoeier und Lindthäschen ist man ja nie zu alt. 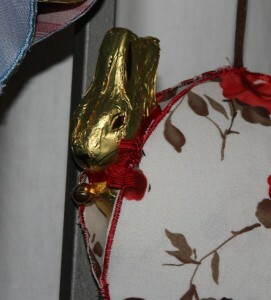 Burdastyle had those „wall nests“ in the March issue and since our Easter visitors are meanwhile to old to search for eggs (or to be more precises I am out of ideas how to give them an age apprpriate egg hunt), but never to old for chocolate eggs and a Goldbunny. The instructions come with a lot of photos, so you can hardly go wrong. What I changed is that I did not like the raw seam allowance, but I’ve sewn the pieces togehter with satin stitch. I like it better like that. Also I closed the side with the opening in the lower third. (Burda leaves it alltogehter open.) Which is a good idea, because I did not do that for the smaller egg and things tend to fall out quite easily. Fabric are cotton brints and woven stripes from my remnant bin. For sewin I used machine embroidery thread, the blur one is from Alterfil, the red one is Gütermann Sulky. Things I had at hand. There are only two things I did not like about the instructions. One is that they do not really tell you when and how to attach the strings. Since the come with many pictures I’d say this is made for a beginner and then such a crucial point should be explained. (No problem for me, of course. But I am not a beginner.) The other issue I had with the fusible. The first (stiff) Vlieseline is ironed ot with a damp cloth, then the Vliesofix dry on one side and then again with a damp cloth for the second that. Which created some wrinkles on the fabric side I had fused first. The damp cloth seams to „unfuse“ the stiff Vlieseline again. Ansonsten sind das aber ganz süße Nester, die auch schnell zu nähen waren. (Die Aufbügelei hat glaube ich fast so lange gedauert wie das Nähen.) Da kann man tatsächlich in Serienproduktion gehen. Otherwise the nests are super cute and were sewn quickly. (All the fusing had probably taken nearly as long als the sewing.) So you can make loads of them. Dieser Eintrag wurde veröffentlicht in Nähen, Schnittkritik, Wohnen und Deko und verschlagwortet mit burdastyle, Osterei, Ostergrüße, Ostern, Schabrackeneinlage, Vliesofix, Wand-Nest von nowak. Permanenter Link zum Eintrag. Solche sollte ich doch auch mal probieren! Einen Schnitt braucht man nicht unbedingt dazu, oder? Und nein, die Anleitung verrät (außer den Maßen) nicht wirklich was, was man nicht vom Bild auch ableiten kann. Und die Maße sind auch wieder Geschmackssache.